I'll be honest. 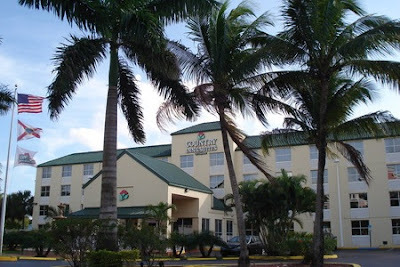 I was bribed into trying the Country Inn & Suites in Kendall. The Country Inn chain has never been on my radar, not due to anything bad, but just because my radar screen can only hold so much, and it usually centers in on Hyatts, Hiltons, and Fairmonts. There's plenty of them down in the Miami area that I could have chosen from, but when the Radisson Big Night promotion (Radisson is the parent company of Country Inn & Suites) offers me enough points for a free night in Paris to try out your product, I'm in. In fact, I'm in twice (Lori and I booked back to back nights). So how did it go? Well let me give you a couple of things to keep in mind before we go into details. Through my incredibly skilled trip planning, it had taken us almost 23 hours to get from our house in Kelowna to the Country Inn & Suites in Kendall. Yes, I like scenic routes. Needless to say, our mindset wasn't fresh and enthusiastic. That being said, our room had beds, which at that point would have made up for any shortcomings that a hotel could throw at us. Except of course, for the room not being ready when we arrived. Apparently the people in the room assigned to us the night before had broken a couple of things, so we were being moved to another suite. The front desk was very apologetic, and promised the room would be ready within a half hour, which it was. We killed the time by going to Burger King and trying the Bacon Sundae. I'm just loaded with bad decisions sometimes. After the kids finished questioning my sanity, we returned and made our way back up to the room. The best way I can describe our 1BR suite is to take a normal sized hotel room, and put up walls to make it into a suite. If that sounds negative, it's not. 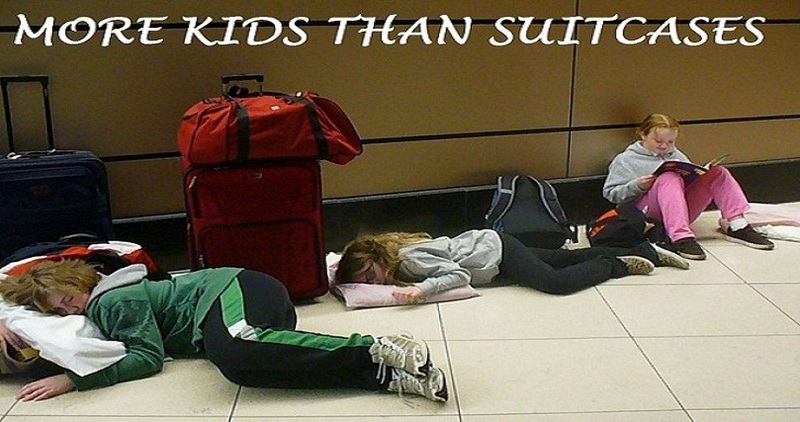 For family travel, simply separating the rooms is a huge bonus. It means that the three of us who like to stay up late can, while the other two can get some sleep. It means that there's two TV's, thus stopping any fights over what to watch. It means that people have to actually get up and go to another room to tell me to stop snoring, and usually that's just too far for them to go. I got a great night's sleep. Despite it's small size, the room still has it's amenities. Immediately upon coming in the door there is a mini-fridge, microwave, and coffee maker. There's also a work desk in the room, although in a bizarre bit of planning, there is no plug available at the desk. This resigned us to the couch with our laptops which wasn't an issue. The internet connection however, was. The Wi-Fi....well the Wi-Fi reminded me of myself in high school. It tested really well (10mb/s down, 5mb/s up), but it had almost a zero attention span. We fought a constant battle to stay connected to the server, although in all fairness we did have nearly a dozen devices connected at any given time. What really impressed me at the Country Inn & Suites though, were the staff. Well, half of them anyways. The front desk staff were fantastic. Very friendly, super helpful, and most importantly, they knew what they were doing. Lori and I booked back to back nights and while some hotels can't seem to figure out how to do that without involving all levels of management, everything was handled quickly and accurately. The points for our stay (including the bonus points) had already posted before we arrived home from Miami. The part of the staff that didn't really impress me however, was the housekeeping, which is odd because we don't use housekeeping on short stays. I don't know why housekeeping feels the need to yell at each other down the hallways. It's 8am people, which is 5am where I just flew in from. Walk down the hallway and ask your question quietly please. Unless of course you're planning on applying for a job at the Hyatt Regency on Capitol Hill. In that case, just keep on yelling. As for price, well you can usually get into a room in Kendall for around $100, but I hear you saying "Sure Steve, $100 plus what kind of fees and extras?" Well let's go over them. There's no charge for the internet (minus your therapy bills from going insane trying to actually stay connected). There's lots of free parking out front of the hotel. You even get a pretty good free breakfast complete with hot items (we had breakfast burritos) and great cereal choices (They had Cinnamon Toast Crunch!). All of that is included in your rate. The Kendall location does have one hidden fee however, and if your family is anything like mine, you can believe that this one is going to cost you extra. The hotel is located on the edge of the Town & Country Shopping Center. I guarantee you that's going to cost you more than any fee a hotel has ever charged you. I'm leaving our stay with a fairly decent impression of Country Inn & Suites. It's not a luxury brand, but they certainly don't price themselves like one. I love not paying for internet/parking/breakfast, and overlooking housekeeping's enthusiasm early in the morning, I found the staff a pleasure to deal with. Have they squeezed their way onto my already crowded hotel radar screen? Probably. They might not be my first choice, but I'd definitely consider staying with them again if the situation was right. So I guess what we're saying here is that I can be bribed...with hotel points. Somehow I'm doubting that comes as a surprise to anybody.